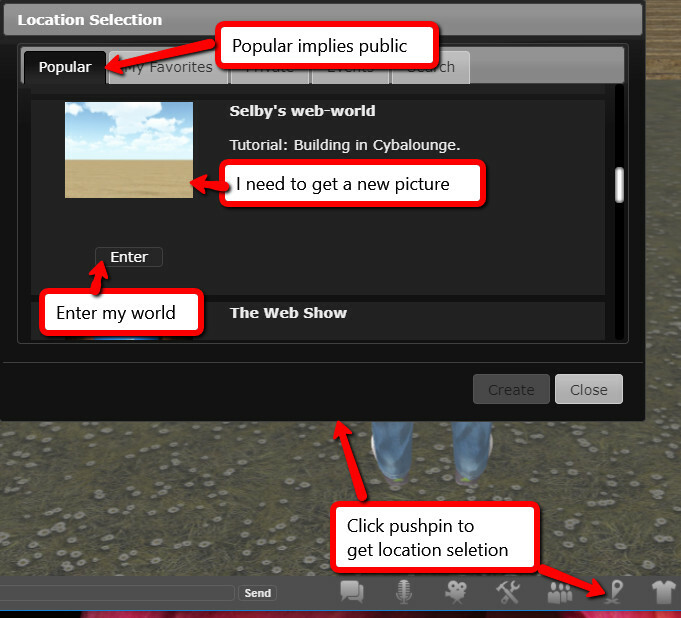 Cybalounge is designed to host multiple web-worlds, like a virtual world grid. Here are instructions on how to find them in the Cybalounge for nonprofits site. Avatar Repertory Theater (ART) prepares a frightful Halloween show. AvaCon hosts the OSCC and provides a persistent site for the annual builds there. This matches the Virtual Worlds Fair concept of a persistent collection of exhibits. Thirza Ember has a special site there that tells about the Hypergrid. 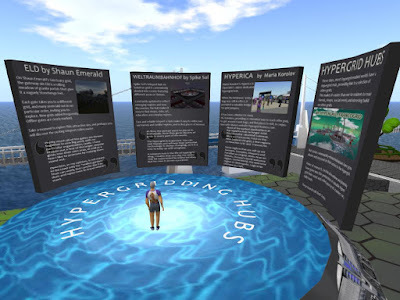 That makes an excellent gateway to introduce newcomers to the worlds of the Hypergrid. .
Publicize and promote the virtual worlds of the Hypergrid. Provide a place for new people to get acquainted with offerings of the Hypergrid. Provide a place for communities and merchants to show their offerings. Encourage promotion of Hypergrid worlds to the outworld. The proposed Virtual Worlds Fair is a distributed place. A collection of venues connected by hypergates. But the main feature will be persistent venues ready for visits any time. So when you meet new people, you can give them a LM to the Fair grounds. 2017 PEOPLE: SEE: HG Safari visits IMA Halloween site. Mal Burns and I visit the IMA site prepared for the IMA Halloween party. Zombies, ghosts, and other strange happenings greet us. The places is also full of weird freebies. Now that we can drag and drop things to build in Cybalounge, we need to rethink the inventory. We may prefer to keep our main inventories on our own computers, keeping inworld only the things we have rezzed there. Your inventory is on your computer. So your portable inventory is with you wherever you take your computer. As long as you go to virtual worlds that let you DND. This will become especially important when avatars can use DND. 2017 EDU: Educational cartoons for kids: Could you make cartoons in a virtual world? Could you make cartoons in a virtual world? Of course you could. Would it offer any advantages? A virtual world is a graphic engine. It can produce animated graphics sequences with simple video capture. Lots of scenery content is available for sale. You can hire people to make content for you: avatars, objects, scenery. You can rehearse the cartoon as much as you want. Maybe it would cut the production cost to a price educators can afford. Mobius grid offers an cartoon-like environment. And some avatars that look like Toons. We know how to get mouth movements to fit the speech. For still cartoons I need speech bubbles. WigFlip. If that is not enough, look here. The main thing you need is a set of educational objectives. And a script for the story. Join Avatar Repertory Theater for our disturbingly gruesome adaptations of Edgar Allen Poe's "Murders in the Rue Morgue" and Robert Louis Stevenson's "The Strange Case of Dr. Jekyll and Mr. Hyde". Coming soon to the A.R.T site at the KITELY virtual world, Halloween 2017 on Saturday 28th 12 noon and 4.00pm Sunday 29th October. 2017 EDU: WW: Are educators leaving virtual worlds? Or just going to lower cost places? Are educators leaving virtual worlds? Or just going to lower cost places? An article in Hypergrid Business announces "Educators sour on virtual worlds." That conclusion may be too sweeping, since the evidence is limited to Second Life, but it is still useful to consider whether virtual worlds are living up to the potential that they once seemed to offer. Model of the ship proposed by Space X to transport people to the Mars Colony. originally in Second Life, now being rebuilt in Kitely. 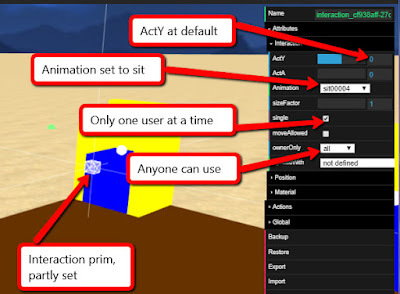 Instructions for using an interaction prim to give a sit pose. Free, no travel, all online: 8th annual Global Education Conference. For the whole community of the internet. Virtual worlds and more. Of course, more. We virtual worlders think outside of the box. Even outside of the virtual worlds. "If you are interested in meeting the ISTE standards for students and teachers related to global collaboration, our conference can help you!" 3rdlife Grid end of summer Car Race. Videos of the races and the winners. Example of content that might go in the Web Report: People and Places edition. 2017 IMA: Promo: WW: The IMA all-hours schedule.